The connection between the Haftorah and Sukkot: Sukkot, one of the Shalosh Regalim, the Three Primary Festivals, was a time when all Jews traveled to the Beit HaMikdash, The Holy Temple. The Haftorah deals with the construction of the Beit HaMikdash. The storyline of this week's Haftorah: Chiram, King of Tyre (modern Lebanon), was King Solomon’s friend. He fashioned all the copper vessels for the Beit HaMikdash. 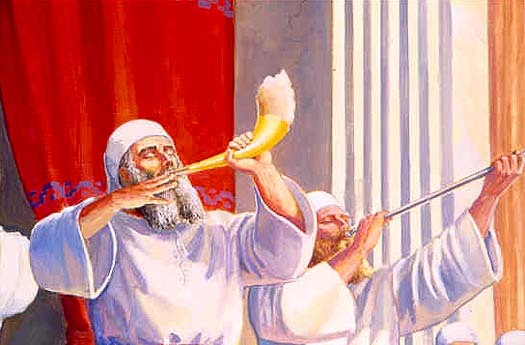 King Solomon orders the production of golden vessels for the Beit HaMikdash. Was crowned as king at the age of 12! He ruled for 40 years and passed away at the age of 52. As King, he led the building of the Beit HaMikdash starting at 16 years of age. It was completed 7 years later. He was extremely wealthy. By some estimations his wealth increased by $250 million dollars a year. He was famous for his stables that housed 40,000 horses and 12,000 horsemen. King Solomon had 700 wives and 300 concubines. Founded 3 cities; Megiddo, Hazor and Gezer in the north of Israel. Instituted, among others, the two mitzvot of Eruv and Netilat Yadayim (the ritual washing of hands) and the third blessing in Birkat Hamazon of Bonei Yerushalayim. The Eruv is a string surrounding an outer perimeter of an area thus designating it as a permissible place to carry things on Shabbat. Authored 3 books: 1) Kohelet - Ecclesiastes 2) Mishlay - Proverbs, which concludes with the song Aishet Chayil sung on Erev Shabbat. 3) Shir Hashirim - Song of Songs. Famous Phrases: Melachim 1, 19:21. “Rabot machshavot belev ish, va’atzat adoshem he takum” “Many designs are in a man’s heart, but only the counsel of Hashem will prevail.” This is said daily in the morning prayers of Yehi Kevod. Haftorahman’s lesson of the week: The Haftorah deals with the Beit HaMikdash, and ideally the holiday of Sukkot would revolve around the Beit HaMikdash as well. Hopefully, the holiday and the Haftorah will cause us all to realize how much we are truly lacking when we do not have a Beit HaMikdash, and through this realization, do everything in our power to have it rebuilt in our time.